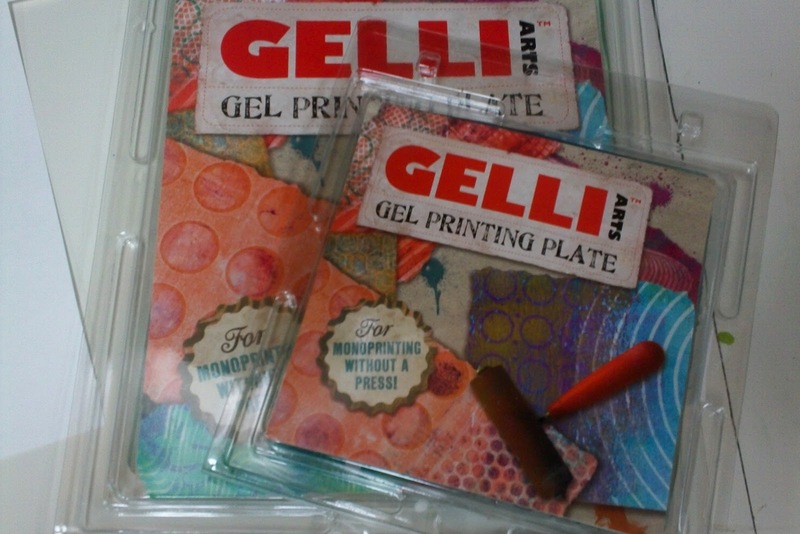 A few weeks ago I received an e-mail asking if I'd be interested in reviewing Gelli Arts Gel Printing Plates. I love trying new products(or new to me products)...so I told them to send them my way! Today I felt like a kid at Christmas when I found the package in my mail box at school. I pulled out the product & read through the directions (always important). Seemed easy enough to use. I'll provide links so you can view some demo's & obtain further information on the product. I first tested tempera paint. 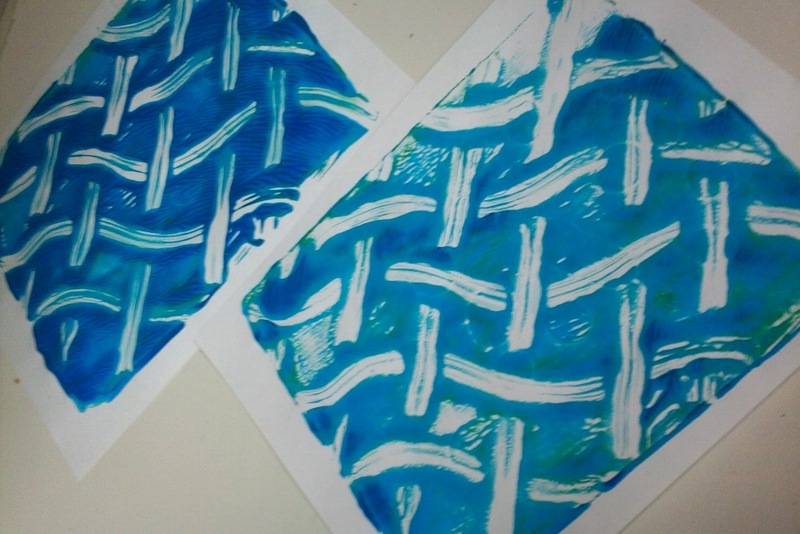 It did want to pull/ball up because of the gel plate, but I still feel I obtained a nice monoprint off of it(the basket weave on the left). This was the 8x10 size gel plate. I then tried acrylic paint. The picture I took is not the best, but I thought the results were very cool. I have been wanting to try a monoprint landscape like this for some time with my students. This was the smaller 6x6 size. Clean up was a snap! I really do like this product, and will keep my eyes open for it in our district approved suppliers!!! I know BLICK carries it presently! THANKS GELLI ARTS FOR LETTING ME TRY YOUR WONDERFUL PRODUCT!! Thanks for the review. If you use the plates in your classroom could you post if your students liked it as well. I have used gelatin prints before using actual gelatin (Quilting Arts magazine did a really amazing article) I will have to look at these to see if they would get the same(ish) result. so what makes these different than using a plexiglass print plate? @ Mrs. Art Teacher - This is Nancy from Gelli Arts - here are our thoughts on gelli vs. plexi - the short answer is the "squishiness" factor. It's effortless to pull a print from the soft gel surface. A plexiglass plate requires pressure with a barren, which takes more time and effort — and doesn't pull as smooth a print. The gel plate is much easier to use, and produces a more uniform transfer of ink or paint. Faster, better :) Hope that helps! I disagree, Its not harder to pull a print off plexi, I got my BFA in printmaking from ASU... this is just another craft tool, nothing more...the only difference is the squishiness, which can add to a variety of textures, but the plexi works equally as well. The bonus of plexi is its much easier to maintain, and no fuss. I disagree Susan. The flexiblity of the plate is what makes it superior to the plexi IMO - I also have A BFA in printmaking from VCU and it's an amazing product. I've used it with my kids and they get great prints from it too. When they press in a texture or image, it doesn't slide around like on plexi. much easier to use, and you can even use the smaller ones as stamps when backed with plexi. Gelli is amazing and so so easy to clean and care for. These colors and textures are so attractive. I am awe-struck looking at them,I want to try them right away. I love doing it all the time with my stencils. You must check out this amazing book by Altered Upcycling too. Hey Mr. E! Great job yesterday at the AOE Convention. 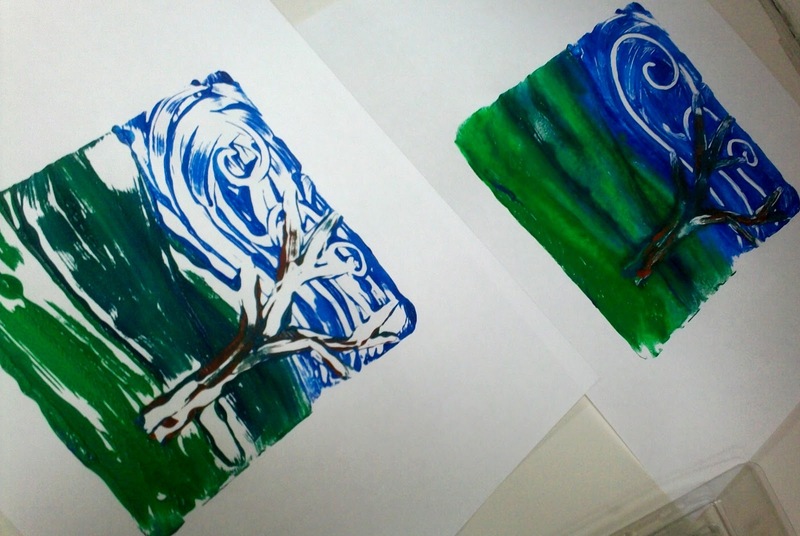 I am wondering if you have used your Gelli plates with your students, yet? I recently purchased one to play with myself and am thinking I'd like some from school but I'm not finding much from bloggers on how they are working out with elementary students. Can you maybe post a blog about your work in your classroom???? Roylco sales the same product at a much affordable price for us public school teachers. it is called Roylco Paint Pad and Tray.